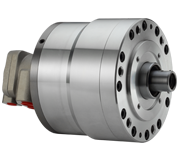 These closed center rotary cylinders are short form, lightweight and come with double rods. Optional pressure relief valves can be installed for safety purpose. Double rod rotary cylinders requires drain port to be independently connected to the oil tank to avoid back pressure.